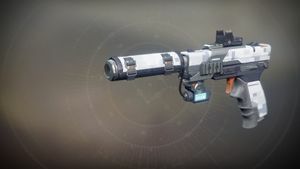 18 Kelvins is a Legendary Sidearm that can be acquired from rank-up Engrams given by Anastasia Bray on Mars. "I never thought I'd be carrying a gun. I'm a scientist, not some kind of soldier. But the way things have been going in the labs… I just don't feel safe any more. I've heard rumors of what happened with the SIVA project, and some of the people involved… let's just say they aren't answering their email. Willa has been seen roaming the halls, keeping an eye on us. At least this sidearm is easy to conceal. I just hope I never have to actually use it." Adaptive Frame: A well-rounded grip, reliable and sturdy. Hammer-Forged Rifling: Durable ranged barrel. Increases range. Fluted Barrel: Ultra-light barrel. Greatly increases handling speed. Slightly increases stability. Smallbore: Dual strength barrel. Increases range. Increases stability. Tactical Mag: This weapon has multiple tactical improvements. Slightly increases stability. Increases reload speed. Slightly increases magazine size. Kill Clip: Reloading after a kill grants increased damage. Opening Shot: Improved accuracy and range on the opening shot of attack.